Here we provide accounts of the life of Mohammed. 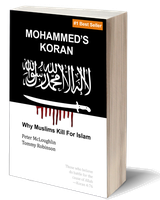 The history of Mohammed's rise to power as a warlord and murderer are kept concealed from the populations of the Western world. In this way, in the absence of any information about the founder of Islam, most people will simply fill in the lack of information with assumptions that the founder of "the Religion of Peace" was someone like Jesus or Buddha. That is why Muslims do not want cartoons or movies about Mohamed -- they know that anything that was remotely accurate would warn the Kuffar of the West concerning their eternal subjugation under Islam. This is the 1967 edition published by The Folio Society (an organisation which sells artisan editions of classic texts). This is a much shorter version of the biography of Mohammed, which came to us via a Hungarian Orientalist who lived in India and translated many Arabic texts. This translation was presented to the Royal Asiatic Society, London in 1898. What is significant about this Folio Society edition is that the Introduction describes Mohammed's violent takeover of Arabia as "a totalitarian state", in the 1960s when the people of the West would have had fresh memories of what such a state meant from the slaughter in National Socialist Germany and in the Bolshevik Soviet Union. It is unimaginable now, a mere fifty years after this edition was published, that any mainstream publisher would have the courage to produce a book that compared Mohammed to Hitler or Stalin. Yet the example of the Islamic State in Syria shows us that what is prescribed by Islam is something even more barbaric than the totalitarian states of the 20th century. This shorter account of the life of Mohammed is commended to those who would be put off by the 860 pages by the full scholarly translation of this book. This most authoritative Muslim biography of Mohammed (translated by Prof. Guillaume, published by Oxford University Press in 1955).